Vail Village Vacation Rentals offers exclusive Vail vacation rentals as well as a full inventory of exceptional ski-in / ski-out vacation accommodations for the 2015 Vail Beaver Creek World Alpine Ski Championships. Book early and save on affordable top hotel-style residence clubs, vacation condominiums and vacation homes in Vail Village and Beaver Creek Village. Be sure to book early if you want a vacation condo in Beaver Creek. We supplement the nicest Vail Village condominiums with a network of private home rentals that are rarely available for the public to rent. 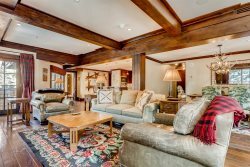 Your vacation in Vail is made even better when you stay in the heart of Vail Village inside this luxurious two bedroom vacation rental. A beautiful luxury rental condominium in the heart of Vail Village. Have lots of fun in this Solaris vacation rental in the heart of Vail Village. Solaris is a community of luxury condominiums and residences in the heart of Vail Village. Luxury accommodations at in the center of Vail Village and a short walk to the Gondola One Ski Lift.